It is with great sadness the family announces the passing of Shirley Marie “Mickey” (Devlin) Clancy which occurred at the Saint John Regional Hospital on Monday, February 4th, 2019. 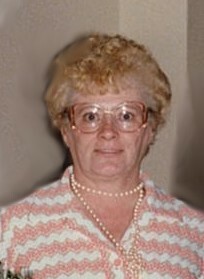 Born 1935, in Saint John, she was the daughter of the late Gerald Francis and Margaret Mary (Nelson) Devlin. Mickey worked for Bay City Physiotherapy for several years. She loved watching TV, knitting and reading, shopping trips to Bangor, camping and attending flea markets. Mickey is survived by her brothers Paul Devlin (Janet) of Rothesay, NB, Karl Gianakos (Joan) of Kelowna, BC; sister Dolores Raymond (George) of Saint John; as well as several nieces, nephews and friends. Besides her parents, Mickey was predeceased by her husband Charles and nephew Michael. Arrangements are under the direction of Fundy Funeral Home, 230 Westmorland Road (646-2424) with visitation being held on Wednesday, February 6th from 2 to 4 and 6 to 8 p.m. and Thursday, February 7th from 2 to 4 p.m. A Mass of Christian Burial will take place from Stella Maris Catholic Church (201 Bayside Drive) on Friday, February 8th at 12 noon followed by an interment at St. Joseph’s Cemetery. Donations in memory of Mickey may be made to the Canadian Cancer Society or to the Heart & Stroke Foundation of New Brunswick.